"You're okay now . . . You're okay . . . because I'll be holding you like this from now on . 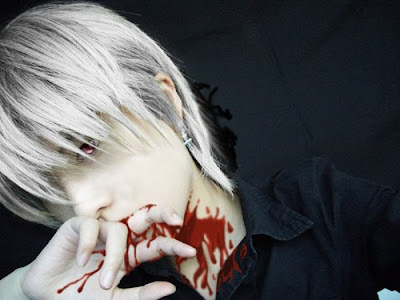 . . You are okay"
Even before becoming a vampire, Zero was noted to be a talented vampire hunter due to being the stronger of a pair of rare twin hunters. Zero bears a tattoo on the left side of his neck originally used to suppress his vampire side, later used to tame him. Zero is a casual dresser, usually wearing school uniform incorrectly with the vest and red tie exposed from under his black jacket and wears a fang like earring. Zero was born in the year of the Dog and is 181cm (5'11) in height. As a child, Zero was a quiet and gentle boy, to the point where Ichiru questioned whether he was even capable of being a hunter. However after Shizuka's attack, Zero developed a strong distrust of vampires. Zero is a tsundere character, he sports a scary aura that makes most of the Day Class students wary of him. However, his innate nature is to protect humans, his cold attitude towards those he loves is likely to push them away and keep everyone at a distance. Following his full awakening into a vampire, Zero harbors a great disgust towards himself because of inability to control his hunger and reliance on Yuki. His dismal outlook on his future and fear of what he might do causes him to give up and he almost kills himself. He fights to ignore his hunger to the point of starvation rather than go to Yuki. He tries to help Yuki resolve her own problems and then impresses upon her that its okay for her to burden and use him because he owes her. Zero is very hostile to the Night Class vampires when they threaten him, however he adopts his standard tsundere attitude when engaging them one on one while retaining a level of politeness. Zero expresses a great deal of anger toward purebloods because of their mechanisms in his life in particular, he extends this hostility toward Yuki as well after she turns into a pureblood. In spite of this, his sense of duty override his issues ensuring his reliability and trustworthiness. His special Gun used to protect the school from the vampires, when they get "wild"
Zero was born in a vampire hunter's family and had a identical twin brother named Ichiru. They, along with Kaito Takamiya, were trained as vampire hunters by Toga Yagari. Kaien later comments that they share a similar line of thinking thanks to this. Yagari lost an eye protecting Zero, when the still naive Zero makes himself vulnerable to ex-human vampire when the nurse turned wild and tried attacking Zero due to her Level E state. This was Zero's first lesson on the dangerousness of seemingly innocent vampires.
. One day Zero and Ichiru were taking a walk and Ichiru saw a women sitting in a tree. Ichiru was in awe of how pretty she was, but Zero told Ichiru that it was a vampire and told him to stay away from her. A few days later, Ichiru ran off and Zero sense the approach of the pureblood vampire and ran to confront her. That vampire took Zero and bit him, hence turning him into a vampire. His parents came out in an attempt to save Zero but were killed, Zero at the time also believed his brother was killed. After that attack Zero was taken in by Kaien Cross, the headmaster of Cross academy. His temperament turned cold and hostile, at times cruel to the young Yuki who reached out to him. Her gentleness won him over, but Zero kept his affection for her to himself, aware that she loved a vampire. However, Zero failed to reveal that he was going to turn into a vampire after Yuki revealed she was afraid of all other vampires. Over the next four years, the two became friends and Zero became her constant protector while Yuki mothered him.